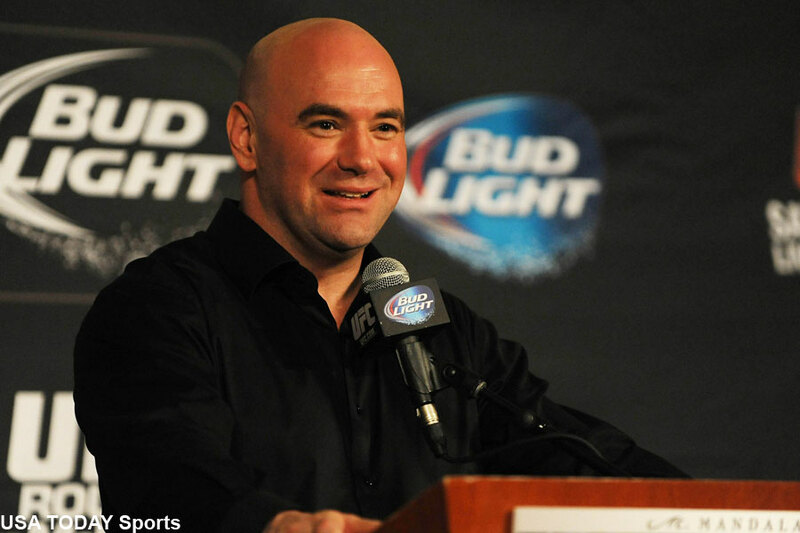 When Dana White (pictured) talks, hardly anyone truly listens because the UFC president seems to lie half the time. When money talks, however, White listens, and that’s why it appears the hotly rumored Floyd Mayweather vs. Conor McGregor boxing match might actually happen. “I do think it’s going to happen,” White said Wednesday while appearing as a guest on “Conan”. “I think it’s going to be a tough deal, because, obviously, there are a lot of egos involved in this deal and a lot of people, so that always make it tougher. This is a far different stance from the one White took just three months ago when he claimed there would be a better chance of him serving as Tom Brady’s backup quarterback at Super Bowl 51 than Mayweather and McGregor meeting in a boxing ring. Although, White did soften his position later by offering Mayweather and McGregor $25 million each, plus a piece of the show’s pay-per-view buys to be negotiated later. Mayweather laughed (literally) at White’s lowball offer, while McGregor never bothered to address it. Mayweather and McGregor have both stated on separate occasions that they each want $100 million guaranteed. Although White sees a light at the end of the tunnel, there’s still a lot of red tape involved. Mayweather has his Mayweather Promotions and McGregor recently launched McGregor Promotions. The UFC is notorious for wanting to control all production aspects for their events. McGregor, the UFC lightweight champion, is also signed to an exclusive fighting contract with the MMA organization. He could try to make the fight happen on his own via the Ali Act, but admitted in January that it would be better to have the UFC involved. White previously predicted McGregor would suffer an “epic fall” if he dared to sidestep them to get to Mayweather. Oh, and of course there’s the money issue. Who gets what? Nonetheless, it appears the fantasy fight is starting to inch closer to reality. “A lot of things make this fight intriguing,” White said. “Conor McGregor is huge. He’s in the prime of his career. Floyd is 40. Floyd has always had problems with southpaws; Conor is a southpaw, and Conor hits hard. When he hits people, they go. Floyd is definitely not knocking him out. That’s for sure. Mayweather announced over the weekend that he has officially come out of retirement with the sole purpose of facing McGregor in June.